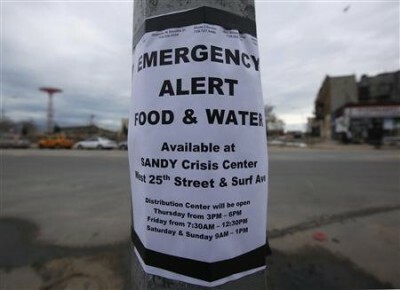 A week after Hurricane Sandy hit the East Coast of the United States, large numbers of storm victims remain without power, heat or a roof over their heads as the cold weather sets in. With the death toll over 100 already, the crisis could be worsened by a winter-like storm scheduled to hit the region later this week, which is expected to bring heavy rains and snow. As of Monday, 1.8 million still remained without power, 900,000 of this total in the state of New Jersey. Utility companies warned that it could be weeks before electricity was restored in some areas. A new storm could knock out power for those who have had it restored, or produce entirely new power outages. The inadequate relief response has provoked widespread anger, particularly in the tri-state New York-New Jersey-Connecticut area, the most densely populated region of the country. Angry residents have denounced New York City Mayor Michael Bloomberg and federal officials for restoring power to the stock exchange and wealthy neighborhoods in Manhattan, while neglecting devastated working class areas in Staten Island, Brooklyn, Queens, and other boroughs. Many residents remain marooned in waterlogged homes without electricity or heat, while the shortage of gasoline continues. Mass transit, schools and other public services are slowly returning, but officials say recovery will take weeks or months. Over the weekend Mayor Bloomberg said some 40,000 people were made homeless as a result of the hurricane in New York City alone. In one of his few truthful comments, the billionaire mayor, compared the humanitarian crisis to the aftermath of Hurricane Katrina, which devastated New Orleans and the Gulf Coast more than seven years ago. The outpouring of volunteers in the most heavily affected neighborhoods testifies to popular concern for the victims of the storm. But this cannot overcome the lack of preparation for the disaster or the delays in aid for those most desperately needing it. The housing crisis remains the most critical issue. Public housing developments in Manhattan’s Lower East Side, in Brooklyn’s Red Hook neighborhood and the Rockaways in Queens, far from adequate even before the storm, were among the hardest-hit areas. Even when electricity had been restored, residents still lacked heat and hot water, with many buildings needing new boilers and other equipment because of storm damage. City officials claimed they were working to find temporary apartments or hotels for the many thousands of families who have already been without basic services for a week. This state of affairs was all the more outrageous in light of the luxury apartments—many of them unoccupied for months at a time—that have mushroomed in Manhattan in recent years. Rather than commandeer these residences for emergency use, officials have packed the homeless into public schools and other substandard shelters. Meanwhile, the Federal Emergency Management Agency (FEMA) is reportedly set to bring in the kind of trailer homes made notorious after Katrina. After more than one week without school, one million students in New York City public schools are returning to classes, in some cases without heat. More than 100 schools remain closed. Of these, 57, normally containing 34,000 students, were damaged and will be unusable for weeks or months. Another 29 schools had no power. In New Jersey 300 out of 589 school districts remained closed. Sixteen New York City schools could not reopen because they were being used to house the homeless. The Graphic Communications Arts School on Manhattan’s west side “had become a homeless shelter” in the wake of the hurricane, one teacher explained to the Times. “The custodial staff would need an entire week” to clean up this building, while of course other space would have to be found for the evacuees who have been living there. Similarly, at Brooklyn Technical High School, one teacher said, “everyone was kind of shocked to think they’d go through with this,” referring to plans to reopen the school by Wednesday although it has been used to shelter the homeless. In New York, the Metropolitan Transportation Authority claimed that it had restored 80 percent of the system, but acknowledged that there would be fewer trains. Several subway lines in Brooklyn and Queens remained shut down. At one Brooklyn elevated train station, the line to enter stretched for three blocks. With the PATH trains connecting New Jersey and Manhattan still shut down, the lines for ferry service from New Jersey were many blocks long. Transportation problems continued amid ongoing gas shortages. Although New York Governor Andrew Cuomo claimed that emergency shipments of fuel were on the way to the New York area, long waits at gas stations continued, with stories of motorists spending many hours in line. Major office towers in lower Manhattan, including buildings on Water, State and Front streets near the waterfront, occupied by major corporate and non-profit tenants, remained badly damaged and shut down a week into the crisis. This has left large numbers of workers without a paycheck. One hundred buildings in the mile stretching south from Chambers Street to the tip of Manhattan remained without heat or hot water, even though electricity had been restored. Some residential buildings in this area housing mainly elderly tenants were also affected. There was ample warning of the dangers posed to the New York area by the relentless rise of sea levels over the past century and their accelerated rise in the past two decades. In 2009, according to a report in the Times, the American Society of Civil Engineers held a seminar in New York attended by corporate and government officials at which the warning of increasingly deadly storms was spelled out in no uncertain terms. The cost of such barriers—which many scientists say would have prevented the devastating impact of the hurricane in New York and parts of New Jersey—is a fraction of the nearly $45 billion in bonuses expected to be paid out on Wall Street this year, and less than half of Bloomberg’s personal fortune of $25 billion.